Sleep apnea is one of human kind’s major health problems. It is estimated that 20% of the human population is affected by sleep apnea. Apnea causes poor sleep quality, decreased quality of life, chronic medical conditions, and early death. If you or a loved one suffers from sleep apnea, you should know and understand as much about it as possible. The following pages are available to give you important information about the disorder and its treatment. Sleep Apnea Syndrome is the result of changes in breathing during sleep. These changes, or events, must happen with a certain frequency in order for the condition to be present. 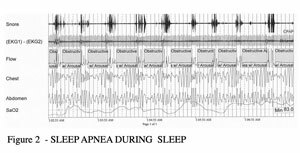 To learn more about what is happening during an apnea event, the causes of sleep apnea, and how we measure apnea events, visit the page, What is it? Do you wonder if you have sleep apnea? Do you know whether or not you should be evaluated for it? What tests are required to determine if you have apnea during sleep? Can testing be done at home? For answers to these questions, visit the Evaluations page. Have you been diagnosed with Obstructive Sleep Apnea? Are you wondering what to do now? Do you want to know more about the treatment options available to you? The Treatments page serves as a general guide to the various treatments currently available. It is important to discuss each option with your healthcare provider or sleep specialist to make sure the option you choose is the right one for you. Most people with moderate to severe Obstructive Sleep Apnea use some form of positive airway pressure to correct the problem. The most common form is constant positive airway pressure, or CPAP, but there are other types of pressure machines and treatments. The various means of treating sleep apnea are reviewed on the Equipment page. OBSTRUCTIVE SLEEP APNEA SYNDROME, WHAT IS IT? What is apnea? What is obstructive apnea? What does it do? Anyone who has been diagnosed with sleep apnea or has a loved one with sleep apnea should know the answers to these questions. Apnea occurs when breathing stops. Obstructive apnea happens frequently when breathing stops because of obstruction of the airway. Apnea means “no breath.” When people have sleep apnea problems they are suffering from interruptions in their breathing while asleep. With the obstructive sleep apnea syndrome, the interruptions in breathing occur when the airway becomes blocked during sleep. The chest and diaphragm are making efforts to pull air into the lungs, but the passageway to the lungs is blocked. Figure 1 shows a five-minute tracing of a normal sleep test. 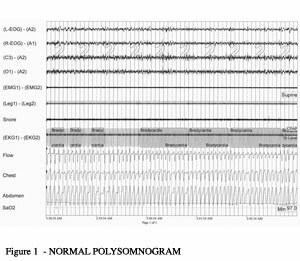 It shows a snoring microphone recording (no snoring is seen on this record), electrocardiogram, flow of air through the nose and mouth, chest and abdominal wall movements, and the level of oxygen saturation. Figure 2 shows five minutes of severe sleep apnea. Note the loud snoring, the absence of airflow (shaded areas on the flow channel), changes in respiratory effort in the chest and abdomen, and the changing oxygen levels. The majority of complaints from patients with obstructive sleep apnea syndrome focus on the quality of sleep. The person frequently does not sleep well, often has non-refreshing sleep and complains of daytime sleepiness. Almost any symptom related to the quality of sleep or the ability to sleep may be reported. Frequently reported symptoms are listed in Table 1. The obstruction of the airway that causes the syndrome is reversible. In fact, it comes and goes. It occurs only during sleep, usually in individuals who have little awareness of the events. While awake these individuals breathe without problems. 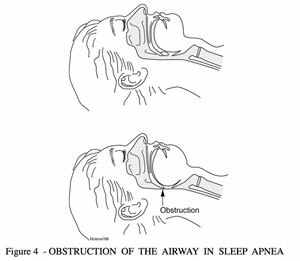 While the reason obstruction occurs remains under research, physicians now know a great deal about the site of the obstruction and individuals who develop obstructive sleep apnea.The site of the obstruction occurs in the upper airway. That is the area above the larynx (voice box). The larynx and the airway below are held open by rings of cartilage and do not collapse. However, above the larynx the reversible obstruction occurs at the base of the tongue or at the soft palate. 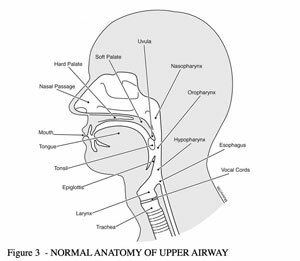 People with obstructive sleep apnea are essentially choking in their sleep.Figure 3 shows the normal anatomy of the upper airway. The obstruction in sleep apnea occurs above the larynx. Physicians have a good idea of the mechanism that results in the obstruction. The vast majority of individuals have no abnormalities of their airways. Their throats show normal tissue in normal places. For a great deal of time it was thought that a specific reason for the apneas would be discovered. However, that has not been the case. A few individuals have significant and obvious problems in their airways: enlarged tonsils, enlarged adenoids, growths or birth defects in their jaw area. These abnormalities result in a small upper airway that obstructs easily upon reclining. Uncommonly, severe hypothyroid problems result in obstructive sleep apnea.The reversible obstructions occur mostly in normal throats. Over the past thirty years doctors have investigated why the obstructions occur and how they occur. It is clear that a large number of overweight people have obstructive sleep apnea. It has been found that when morbidly obese individuals with sleep apnea lose weight, the obstructive sleep apnea will go away about fifty-percent of the time.Thin people have obstructive sleep apnea, too. Men, women and children have obstructive sleep apnea. They may be tall, short, thin or stocky. Studies have shown that five to fifteen percent of the American population has some degree of obstructive sleep apnea. After studying thinner individuals and obese patients who still have obstructive sleep apnea after weight loss, medical specialists are beginning to come to the conclusion that there are two major factors that result in the obstructions. The two factors are: 1) the degree of muscle relaxation that occurs in the upper airway muscles during sleep and 2) the size and shape of the throat.Figure 4 demonstrates the site of obstruction for the majority of patients with the obstructive sleep apnea syndrome. The arrow shows the area where the palate and tongue obstruct the airway during sleep. APNEA – WHAT DOES OBSTRUCTIVE SLEEP APNEA DO? The obstructive events have two major effects. First, the events cause a disruption in the sleeping patterns of the brain and second, the events place a stress on the cardiovascular system. When the obstructions occur, the brain senses that the breathing is not effective and breathing efforts are increased. The effort needed to open the obstruction can awaken the sleeper, or at least cause the person to change to a lighter stage of sleep. These events result in release of stress hormones, changes in heart rate, changes in blood pressure, a drop in the blood oxygen level and other changes.Apnea will ruin a night’s sleep. People perceive that sleep is a quiet, inactive time. However, sleep is a very active time for the brain. Imaging studies demonstrate that during sleep the brain functions at a high level in a rhythmic pattern. It could be interpreted as ‘when we sleep, the brain works and the body rests’. The obstruction of the airway, disrupts the rhythmic pattern of the brain during sleep. This pattern will be restarted over and over again, but the obstructive events interrupt the processes. A few individuals will wake when the obstructions occurs, but most will have no idea what is happening. They will complain of a bad night, feel like they haven’t slept or feel sleepy during the day. It affects each person differently, but for everyone, sleep is disturbed at some level by the obstructive events and symptoms usually follow. Symptoms and patients’ comments are listed in Table 1 above. HOW IS THE SEVERITY OF OBSTRUCTIVE SLEEP APNEA MEASURED? Many of us are reluctant to seek help for sleep problems. We dislike having someone outside our inner circle involved in such a personal problem. In the past, it was not unusual for physicians to tell patients that a sleep problem was all in their heads. Now, the medical profession is more enlightened and knowledgeable. There are professionals who specialize in sleep problems. Are there alternatives to the polysomnography test for sleep apnea? The American Academy of Sleep Medicine, Medicare and essentially all health insurance companies require a polysomnogram performed in a sleep center for the diagnosis of Sleep Apnea Syndrome. Several testing techniques are used to screen for the problem. If an abnormal result is obtained, a polysomnogram is usually required. The most commonly used screening test is an overnight oximetry. There are a number of commercially available home testing systems. Since insurance does not pay for home sleep tests, no particular test is widely used. People frequently ask how to select a sleep physician or a sleep center that can provide advice and help. As always, the informed person is the wise consumer. Ask your physician. Ask friends and colleagues. Check out reference sources. Sleep physicians in each state are listed on the American Board of Sleep Medicine’s web site. Most states have web sites that list local sleep physicians and their qualifications. If you have been recommended to a center, check to see if it is accredited by the Academy. Also, determine the ownership. Centers owned and operated by physicians or hospitals are usually a good choice. Centers owned and operated by medical equipment companies and business entrepreneurs should be suspect. What should be of concern to the potential patient? Who is the physician responsible for the testing and the interpretation of the test? Is he a local specialist? Can he be seen if you need help with your sleep problem? See ‘What to Look For in a Sleep Center’ for more information. Sleep apnea syndrome is caused by frequent reversible obstructions of the upper airway causing interruption of sleep. These obstructions have two effects on the person who has them. First, symptoms of disturbed sleep result from the interruptions. Treatment should improve the quality of sleep and reduce symptoms. Second, the obstructive events can cause long-term consequences. High blood pressure, heart attacks, strokes, diabetes and elevated cholesterol levels have all been associated with increased frequency of obstructive events. Treatment should also be able to prevent these problems. In fact, treatment of apnea, when it successfully eliminates the obstructive events, has been shown to achieve both of these goals. How do we treat individuals with throat collapse and those with excessive body weight as they work to lose weight? The three traditional categories of treatment are medications, surgeries and medical devices. The miscellaneous causes of apnea are beyond the scope of this discussion. Under ‘Obstructive Sleep Apnea, What is It?’ the causes of sleep apnea were reviewed. Excessive body weight is seen in over half the patients diagnosed with sleep apnea syndrome. There is evidence that with weight loss the sleep apnea of about half of the overweight patients will disappear. Weight loss is strongly encouraged in all overweight individuals. It is the treatment most likely to result in a long-term resolution of the problem. The two types of medical devices used to treat obstructive sleep apnea are positive airway pressure and dental appliances. It has been known for over twenty years that obstructive sleep apnea can be corrected by positive airway pressure. When the air pressure in the throat is raised to slightly higher than the local atmospheric pressure, the throat does not collapse. When the throat does not collapse, the obstructive sleep apnea syndrome is corrected. The symptoms resolve and the risk of long-term complications are markedly reduced. With consistent use of positive airway pressure, the symptoms related to poor sleep are usually resolved and the long-term risk for elevated blood pressure, diabetes, elevated cholesterol, heart attack and stroke returns to that of the population without sleep apnea. Positive airway pressure is the primary therapy for all levels of obstructive sleep apnea. Positive airway pressure is a simple concept. The details of the treatment are covered under the Equipment tab above. Dental appliances work by holding the lower jaw (mandible) forward. This holds the back of the tongue away from the back of the throat and at the same time pulls the palate forward. The appliances are effective in reducing obstructions, especially in individuals with lesser problems and may be of value in patients who suffer from milder levels of sleep apnea syndrome. Dental appliances are considered when therapy with positive airway pressure fails. If the obstructive events are low in number and the person’s symptoms are mild, a dental appliance may be effective. In the vast majority of patients with sleep apnea syndrome, throat collapse during sleep is the cause of the obstructive events. It appears that both the size and the shape of the throat, along with the relaxation of the pharyngeal muscle tone, determine if the throat will stay open or collapse during sleep. There are no known medications that increase the size of the throat or increase the muscle tone of the pharyngeal muscles. At present, there are no medications to prevent and treat sleep apnea. If abnormalities are discovered in the upper airway, then surgery may play a major role in the correction of obstructive sleep apnea. For example, removing enlarged tonsils that are obstructing the airway will often correct the apnea in those individuals. For individuals who have no anatomic abnormalities, surgeries have been designed to treat their obstructive sleep apnea. All the procedures are designed to increase the size of the throat, either at the level of the palate or at the base of the tongue. A number of procedures have been described for both locations. The procedures have some general features in common. They are not used as the first treatment for obstructive sleep apnea. Generally, when used they are successful less than 50% of the time, are quite painful for two to three weeks afterward and have some associated long-term complications. There is a third type of surgery which is a major surgical procedure designed to enlarge the space behind both the palate and the tongue. In this procedure, both the upper jaw (maxilla) and lower jaw (mandible) are moved forward. Maxillo-mandible advancement is a technically demanding major surgical procedure which is only effective 70% of the time. Because of the low success rates, surgical therapies for obstructive sleep apnea are used when traditional therapy with positive airway pressure fails. Obstructive sleep apnea is treated to both eliminate symptoms and to eliminate the obstructive events. Symptoms that result from the problem should be resolved or improved. The obstructive events need to be eliminated. Correcting the AHI to a normal level ensures the reduction of long-term adverse events to a normal level. Any treatment chosen should achieve both goals. The success of treatment should be measured both by how you feel and what happens to the obstructive episodes while you sleep. How you feel will be clear to you, but the obstructive episodes will not always go away when symptoms improve after treatment. To ensure that the obstructive events have disappeared, retesting is indicated after weight loss, after surgery to enlarge the airspace, and after dental appliances are properly fitted and used. If the treatment is positive airway pressure, a sleep test while wearing the pressure mask is usually performed prior to beginning treatment. This ensures that the events are resolved and determines the appropriate pressure for home therapy. If not retested at the sleep center, a home test should be used to ensure that the events are resolved. Under the “WHAT IS IT?” tab above, we described what it is and how it affects a person who suffers from it. This portion of the site is designed to introduce the treatment of obstructive sleep apnea with positive airway pressure. There are several special features available in many, if not most, pressure machines.The most common feature is a ‘pressure ramp.’ The ramp feature allows the machine to gradually increase the pressure delivered over a period of five to forty-five minutes. This permits the person to fall asleep at a low pressure. Then it is slowly increased to the set therapeutic pressure. It is particularly helpful when someone first starts using CPAP. ‘Memory card’ options are available for many machines. The card records certain information on the machine’s performance and can be ‘read’ by your physician. The information explains how the machine is being used and what happens while it is used. It is particularly helpful if the person is having problems. The problems can often be identified and correted from the information on the card. This may help one avoid another sleep test. The nasal mask covers the nose and a seal is formed against the face. An example of a nasal mask is the Respironics Comfort Gel™. The nasal pillows mask rests just inside the nostrils and create a seal at the outer edge of each nostril. The ResMed Swift II™ is an example of a nasal pillows type of mask. The final mask type is an oral mask. Fisher & Paykel’s Oracle™ is the only variety available on the market. This mask is not used very often, but may be of benefit to a person who has severe skin reactions to the materials of some masks, or who has severe airflow obstruction through the nose.